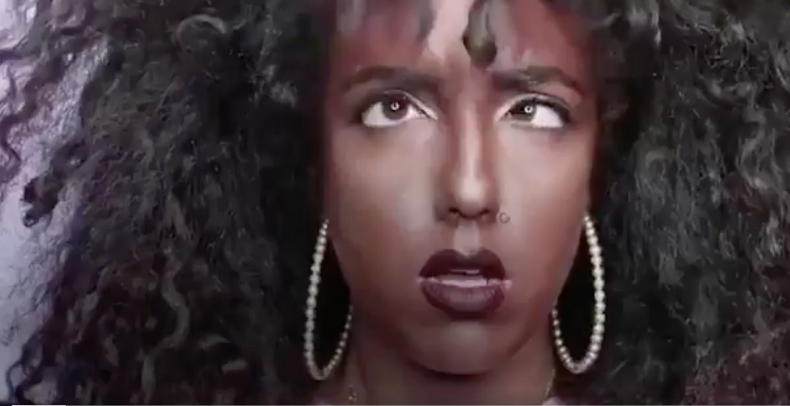 French YouTuber Shera Kerienski made a video where she did full blackface and - get this - people weren't very happy about it. Yes, in a turn of events that was seemingly surprising only to Shera herself, the YouTuber faced enormously backlash for doing something that is so clearly a bad idea that now when you type the phrase 'bad idea' into Google, it just displays a picture of Shera. The history of non-black people painting themselves to 'look black' is long and complicated, but in the modern world 'blacking up' is almost universally linked to negative racial stereotypes and cultural and racial appropriation (in the most direct way). This is due to the fact that, historically, when actors were playing blackface characters, they were almost always characters that exemplified racist notions. It is now, regardless of intentions, seen as offensive, as the act is traditionally so intrinsically linked to racism. Shera took to Twitter to apologise for the video, saying that she had no idea that blackface is offensive. We're not sure how on earth it is possible that she has lived her whole life without ever clocking that that is taboo but hey, that's the excuse she's running with. #SheraIsOverParty has been trending for a few days now as the story gets picked up worldwide.